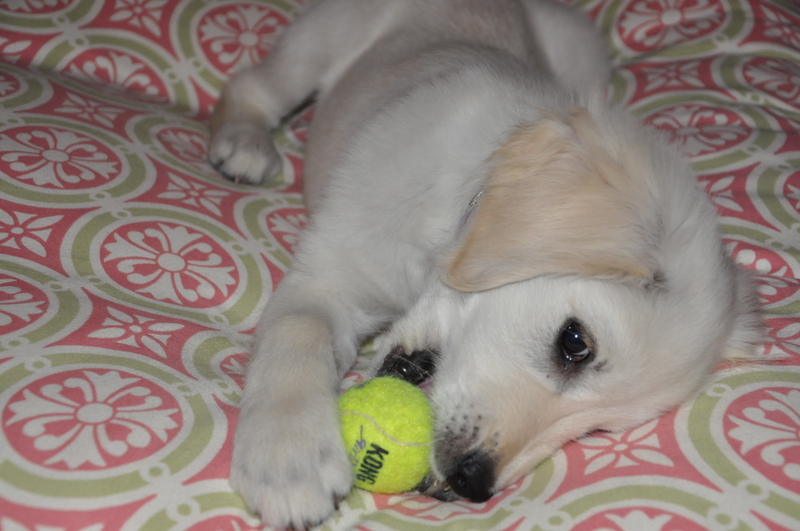 These yellow BALLs are completely irresistible. I cannot watch them fly without running them down and picking them up with my mouth. My mom taught me to bring it back to her, but sometimes I just want to lay in the grass and chew on the ball. I will go and grab it about 5 times in a row and bring it back and then I just chase it down and run away from my mom when she tries to get it from me. It is my game within her game. I try to play with the Tennis Balls as she calls them in the house too, which she lets me do ‘sometimes’. I can't stop playing with this ball. I also can’t keep still long enough for a picture to be taken of me. My mom kept trying to get me to hold still, instead I just kept rolling around while she danced around trying to take a picture! Ha!